It's been 6 long years - 3 bad set backs and all, but I'm here now. I have been on my hair journey since late October 2007. By now, you would have thought that I should have been waist length, or even hip length. I thought so myself too when I first started my journey. But I was so wrong! I can not say that my hair journey was horrible. It could have been worse than horrible. 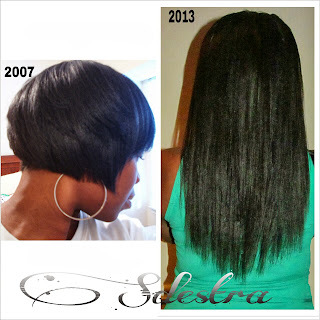 I will say that my hair journey was normal except for the set backs I experienced. And those set backs did set me back where I had to let go of the idea of having long hair for a while. Let us remind ourselves again that it happens and we must learn to accept it, understand it and learn from it. 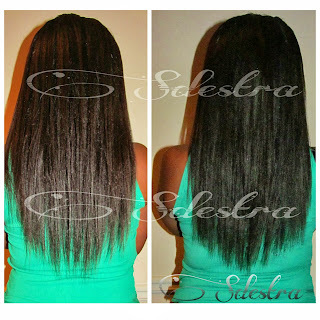 Here are the bad set backs I had during my hair journey. I colored my hair (slightly bleached it and then put on a rinse). My hair started to slowly break off and it was so dry and brittle. Will I color my hair again? No, I will only do color rinses. I don't even want to think about doing henna....at least not yet. What did I do: I decided to focus on the health of my hair, clip my ends and while staying at bra strap length. This has been over the course of three years of being bra strap length, trying to get rid of the bleached/dyed hair completely. I suffered from post partum hair shedding. I lost all of my edges and had a bad widow's peak. My shedded hair looked like tumble weeds on my bathroom floor. What did I do: I did more cowashes, protein treatments, rubbed castor oil on my scalp and styled my hair that would last a whole week. I was also afraid to comb or even touch my hair, but mostly used my fingers to comb and conditioner to detangle before a wash. And of course, I kept taking my prenatal vitamins. What did I do: I deep conditioned, cowashed, protein treatments and massaged my scalp with castor oil at times. And since I do not like my hair down during the summer, I had it in a bun most of the season. Patience was been key during this whole hair journey. I would have loved to stick to getting my hair long. But you know what...health is even better. Does not make sense for me to have long unhealthy hair. For those of you who have been on a real long hair journey, it's okay. I am on one and look where I am now. Instead of giving up and being upset about never have long hair, I decided to shift my focus to wanting healthy hair. And yes, I had moments of frustrations, moments where I wanted to chop my hair off and moments where I said that I did not care about this whole hair journey thing....those thoughts occupied my mind after I saw how damaging my hair started to become after the hair color. Right now, my focus is still the same to this day...HEALTHY HAIR. Of course, a healthy diet, vitamins and water too. 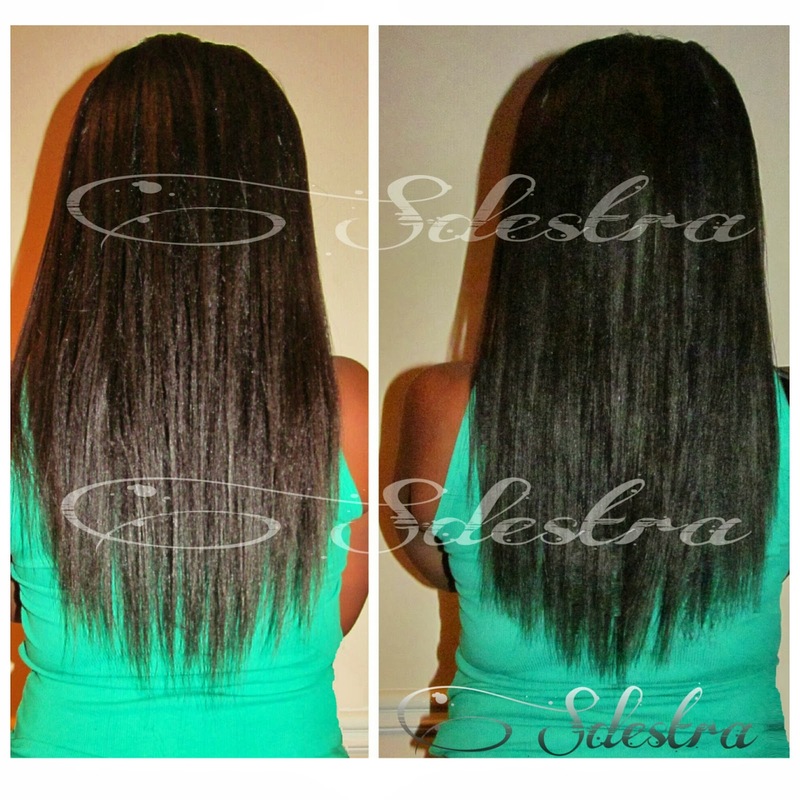 I always say this, "A healthy head of hair will always turn heads no matter at what length." (My hair was not colored, the photos were taken at two different times of the day with flash. Thanks for reading, enjoy the pics and we'll chat soon! wow yes you are so right, set backs do come and go but the end results is what makes the biggest accomplishment. woo! what a hair journey indeed! Great results! Girl, you're hair is so gorge! Your hair looks amazing... beautiful hair for a beautiful Sista! "A healthy head of hair will turn heads no matter what." YES GAWD! Love your hair girlie! Thank you, thank you, THANK YOU!! Your hair is SO beautiful, and seeing that consistency and perceverance really is key - girl, let me just say that you have given me new inspiration to stick it out and keep my hair healthy and happy and to not stress about the length too much, but to focus on health more. Great motivational post! 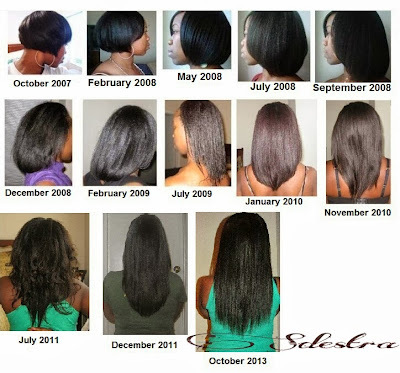 Especially for those of us who've experienced some bumps in the road on our healthy hair journeys! It's taken me three years to get from ear length to shoulder length. My hair is natural and I like to have it out in a cute fro. I've been feeling low about my slow hair growth, but looking at your pics has really reinforced my dedication to my hair. thank you. and your hair is beautiful.